Al-Sa’deiyeh team won the tournament of five participated Jerusalemite Nehiborhoods in which they won the final match against Bab Hutta Nehiborhood team in a result of 2-1. 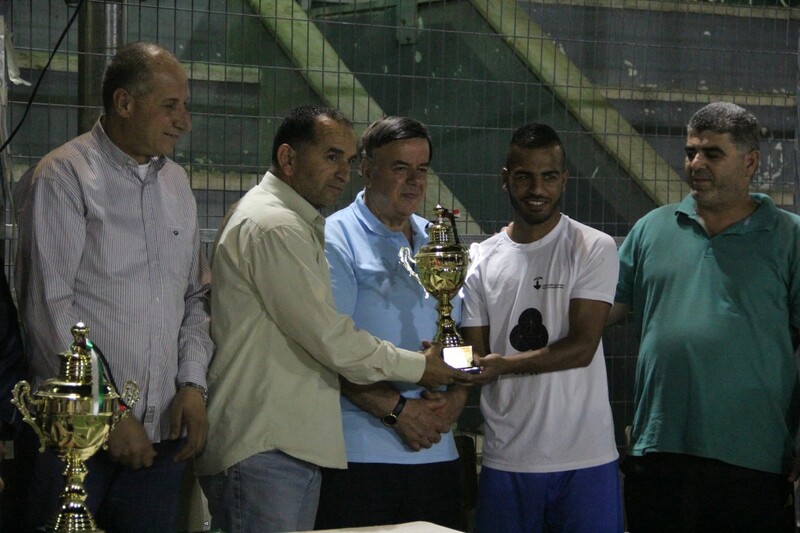 The tournament was conducted on Burj Al-Luqluq pitch and in the presence of Qudsna Gathering members Yousef Fteha and Mufeed Jaber, board of directors member of Al-Muwazafeen Team ‘Sameer Nijem’, member of Prisoner’s Parents Affairs Committee ‘Ala’ Haddad’, The Jerusalemite prisoner and reporter Marwan Tiro, Head Officer of Burj Al-Luqluq Social Center ‘Naser Ghaith’, the Treasurer Imad Shaloudi, committee’s member Iyad Al-Za’tari, the executive manager Muntaser Idkaidek, sport advisor and manager ‘Nihad Zughaiar’ and a group of athletes and crowds from Jerusalemite nehiborhoods. The final match was set off between Bab Hutta and Al-Sa’deiyeh at 10:30 pm under the supervision of Nihad Zughaiar and in the presence of fans and administrative staff.